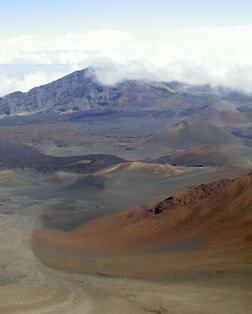 From the summit of Haleakala and its volcanic landscapes, to the subtropical rainforest, fresh water pools, waterfalls and miles of trails, the land has a special connection to the Hawaiian culture. The marine life of the Hawaiian Islands are showcased in over 60 exhibits, including a 750,000-gallon saltwater aquarium with an underwater see-through tunnel offering 240-degree views. This winding drive along lush coastline has 600 curves, 54 bridges, and is famous for its unspoiled beauty, from verdant rainforest and cascading waterfalls to dramatic seascape vistas. This 4,000-acre park has a tranquility set amongst one of Maui's most iconic landmarks, the Iao Needle, a 1,200-foot rock outcropping. Walk the path to the outlook for great views. Maui is humpback country. Shielded by the mountains, the waters off West and South Maui are calm, with high visibility, and humpback whales are attracted to the area's shallow waters. Though this volcanic crater simply appears as a small crescent ridge from above, it reveals a wealth of magnificent coral and colorful fish beneath the sea-perfect for snorkeling. Visit a traditional Hawaiian village and taro farm, or travel through history on an award-winning guided tour, from the remains of King Kamehameha's brick palace to the burial site of Hawaiian royalty. Submarine dive adventures and breathtaking helicopter tours offer a memorable experience on Maui, though you can still capture the essence of the island by hiking and keeping your feet on the ground.